A black and white photograph of 1621 Brock Street South. Located at 1621 Brock Street South, this house was built in 1858 as a hotel by Thomas Bredin. From 1874 to 1973 it was owned by John Allingham Watson and his descendants. The basement is made of Kingston limestone, brought to Whitby in sailing vessels. This house has since been demolished. 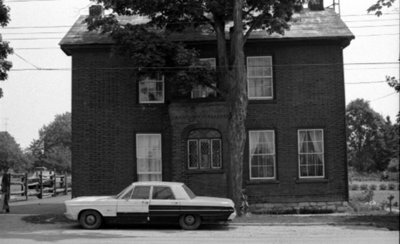 1621 Brock Street South, July 1975, Brian Winter. Whitby Archives A2013_004_038A.